Mayor Bill de Blasio announced his affordable housing plan on May 5, 2014 to create or preserve 200,000 units of afforable housing. De Blasio provided few details on specific development projects or neighborhoods that would be targeted, but administration officials called the plan a blueprint for moving forward. “We know that if we’re going to address inequality, particularly if we’re going to address income inequality…we have to go straight at the biggest expense every New Yorker faces,” de Blasio said during a press conference. Nearly 80 percent of the plan will be focused on families making less than $67,000 a year, according to the mayor's office. That includes protecting the city's rent-regulated housing stock by fighting evictions and using tax incentives to encourage landlords to keep rents low. De Blasio added that he will work with Albany next year to renew and strengthen rent-regulation laws for the city, while pushing for greater City Control over those laws. The plan would also change the affordability requirements that make developers eligible for tax and other incentives from the city. Previously, developers only had to make roughly 20 percent of their projects affordable. 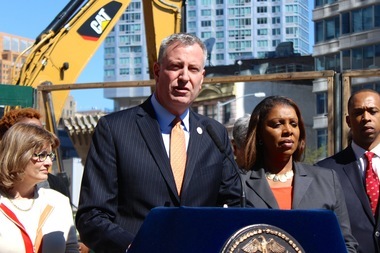 Under de Blasio’s plan, development projects would include a broader range of incomes. For example, a new pilot program is being launched through the city’s Department of Housing Preservation and Development that would create projects with 20 percent low-income housing and 30 percent middle-income housing, while allowing the rest of the units to charge market-rate rents. “If your staff is willing to sit down with the development community and create sensible density bonuses, tax abatements, and other incentives, there is no reason we can’t create the thousands of much-needed apartments for those hard-working New Yorkers who struggle to find housing options,” Picket said. To help pay for the plan, the city says it will commit $8.2 billion over the next 10 years, most of which will come through existing funding streams. De Blasio said the city would work with both Albany and the federal government to maximize housing spending for the city. At the core of the neighborhood-level aspect of the plan will be mandatory inclusionary zoning, which will require developers to provide agreed-upon levels of affordability in rezoned areas, though officials said those levels will vary from project to project. City Planning chairman Carl Weisbrod said the city is looking at about a dozen neighborhoods to target for rezoning. One of those will be East New York in Brooklyn, where the city will look to create new mixed-income housing and mixed-use development along transit corridors like Atlantic and Pitkin avenues.